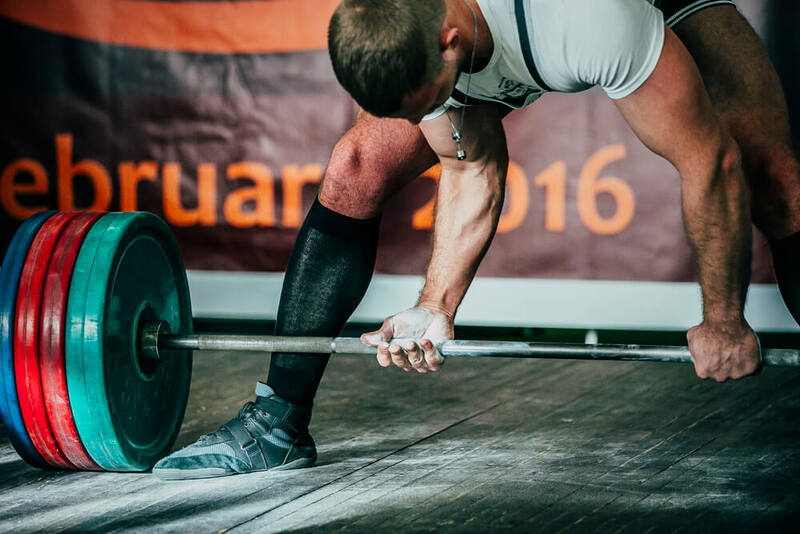 Are you looking for ways to increase your deadlift quickly? Usually, I would say there are no shortcuts and it takes time and consistency. However, finding the right pair of deadlift shoes is something that can have an almost instant benefit. Wearing a shoe that feels comfortable, stable and allows you to get in a good position for deadlifting can make a real difference. 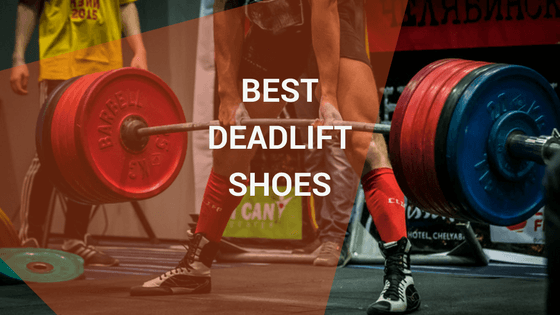 This article will give you an overview of the best shoes for deadlifting available and provide you with all the info to help you choose the right ones. Just like running, football, basketball and squatting, there is a whole range of footwear options. There are some great and not so great ones. 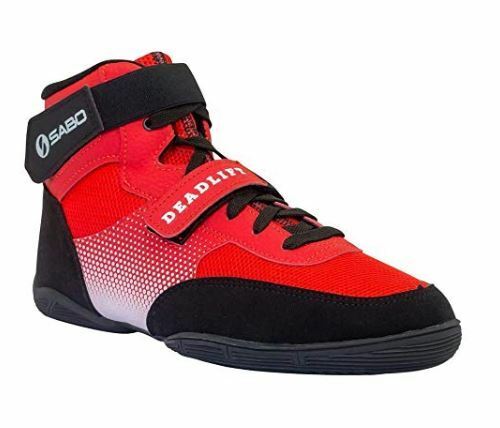 Here is a quick list of my top picks for deadlift shoes, click on the links to be taken to their purchase pages. You can read an in-depth review on each further down the page. 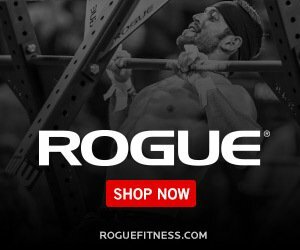 Olympic weightlifting shoes for deadlifts? SABO deadlift (built for purpose). My winner. 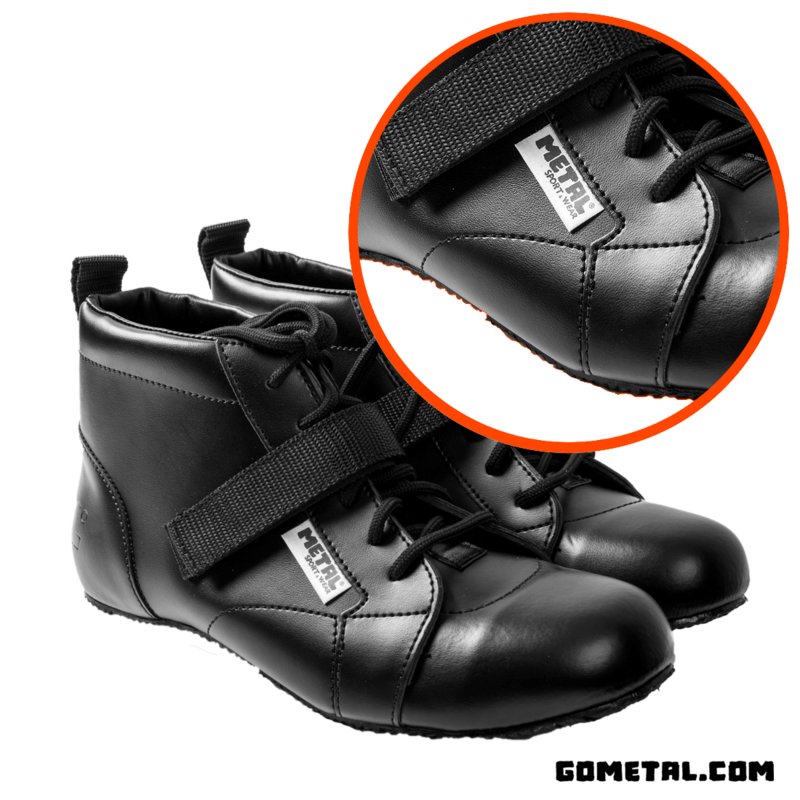 Metal Deadlift shoes (built for purpose). A completely flat sole means that you will have more surface area in contact with the ground, which allows you to feel more stable and in control during the lift. It should lead to greater force output against the resistance. Ideally, you want to be as close to the ground as possible for a deadlift. The closer you are to the ground, the higher the bar will start on your shins. You won’t have to lift the bar as far, which should make things a lot easier. It's the reason many people like to lift barefoot or in just socks. However, some gyms might not like this and if you ever plan to compete in powerlifting, you will be forced to wear something on your feet. Your soles must offer you enough traction on the platform. Having your feet slip when you are half-way through a heavy lift is something that you certainly don’t want to experience. Seriously though, sumo pullers will be pushing out with their feet so need to make sure there is sufficient grip to prevent a very painful attempt at doing the splits. Finally, your shoes should feel nice and compact around your foot with very little movement inside them. Ankle support is also quite important, you don’t want your foot to be shifting from side to side inside of the shoe as you lift. High top shoes are quite a popular option for that very reason. A word of advice for wearing high tops. You need to make sure you still have enough mobility and range of motion at your ankles. If your shoe starts to limit ankle dorsiflexion (the ability to point your toes towards the ceiling), it could alter your leverages and technique. A powerlifter lifting in a pair of SABO deadlift shoes. This pretty much disqualifies all running shoes. These types of soles are great for absorbing the impact from pounding the pavements on a run but they will not make for a good deadlifting trainer. As I stated earlier, you need maximum stability throughout your foot. The spongey soles of running shoes compress very easily, they are supposed to. Under a heavy load, more compression can cause uneven foot to ground contact and possibly lead to injury. Your shoes could tick the box of a flat, sturdy sole but if they too thick then you probably want to look elsewhere. Again, a thicker sole will mean you need to pull the bar further. You will essentially be doing a deficit deadlift all the time. 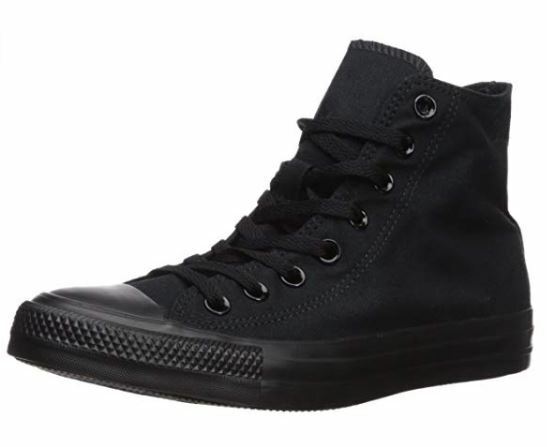 Converse chuck Taylors are a popular deadlifting shoe and they have a 4mm thick sole. This is about the maximum thickness I would go for. When you are performing the lift, especially in sumo again, there will be a lot of pressure on the outside of your shoes. The pressure should be there if you're using your glutes properly to prevent your knees from caving in. If your shoes aren’t strong enough or supportive enough to hold up to the constant pressure on their sidewall, they won’t be lasting long at all. They are a heeled shoe that artificially increase your range of motion at the ankles to help users stay upright at the bottom of a deep squat. Keeping very upright is important for Olympic weightlifters since they usually catch the bar in an extremely deep squat position. As far as using Olympic lifting shoes for deadlifts goes, I don’t like them and most people probably would do better with a completely flat shoe. However, there are a select few that may find they benefit from a bit of extra quad activation at the start of the lift due to slightly greater knee bend forced upon you by wearing the raised heel. All you can do to be certain, is to try deadlifting in Olympic shoes for yourself and see how you feel. You should be squatting regularly anyway. Since I recommend that most people use an Olympic weightlifting shoe for squats, you should already own a pair that you can try. In fact, I suggest sorting out your squat shoes before you think about deadlift shoes. 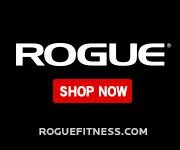 I have a guide on the best lifting shoes for squats and oly lifting. I feel footwear is likely to play a much bigger part in your squat than deadlift. Ok, if you didn't skip straight here and read the guide above, you should now be fairly certain on what to look for in a good pair of deadlift shoes. In this section, I wanted to go through my picks for the best deadlift shoes in a bit more detail. To help you make a better informed decision, I have given a description and some reasons for and, in some cases, against each shoe. Overall, these are kind of a “they will do” type of shoe. Meaning, if you are on a budget, “they will do”. If you already have a pair laying around, “they will do”. If you only other option is a running shoe, “they will do”. These are very cheap and not a bad all round weight training shoe. Probably not the best if you plan on doing any type of running or plyometric work, but this is about deadlifting so I will judge them on that. The sole is fairly solid and flat, although they can curl up a little at the toes over time. The canvas uppers on the shoe are flexible to allow good ankle mobility in the high-top versions. However, they can come away from the soles on the side of the shoe over time. These shoes really aren’t built to take the kind of wear and tear that weightlifting can cause to them. Generally, they are pretty comfortable. The flexible canvas versions can be pulled very tight with the laces so your foot will be snug in the shoe. As I already touched upon, the support of the canvas isn’t great though so your foot will still move from side to side, despite being tight inside the shoe itself. These are very good deadlift shoes. You would expect them to be, it’s what they were made for. Many people use wrestling shoes for deadlifts and you can see some similarities here. The soles are super thin at around 2.5mm, which is very close to deadlift slippers. These shoes are certainly going to be a better option than slippers for sumo pullers, due to the increased traction of the soles. The SABO shoe is pretty supportive on foot, more so than a wrestling shoe, as they do offer some extra support to the arch. The metatarsal strap across the forefoot of the shoe is an excellent addition. It means you can adjust the fit of the shoe to be as tight and snug as you like. Obviously, these are a higher-top shoe so the ankle support on offer is also very good while still being comfortable. For deadlifts, these are my winners. They beat the Metal deadlift shoes for me because they offer a bit more comfort and look better (I know that looks shouldn’t matter for deadlifting shoes, but it definitely does for many people). You could use them for your other lifts but I like a heeled shoe for squats personally. If you squat better in flat shoes, then you could very well wear these for those too. Pricing is actually really good on these. Much cheaper than you would normally expect to pay for a specialist kind of shoe. 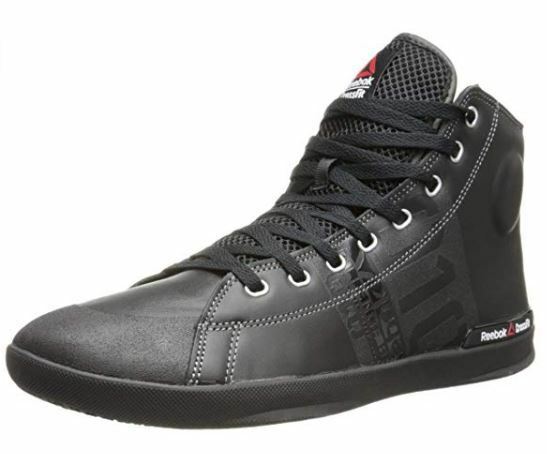 Update: Sabo have recently released a new pair of all-round powerlifting shoes called the "Sabo Goodlift". In the Sabo goodlift vs deadlift argument, I would still choose the deadlifts since I don't feel the difference in price makes the goodlifts worth it. These shoes are also purpose made for deadlifting in. The upper is strong leather so you don’t need to worry about driving your foot into the sides of them, they will certainly hold up to it. These are pretty comparable to the SABO shoes to be honest. I think they may mould around the foot better due to the leather upper which is made from two separate pieces. The Metal shoes also feature the strap across the forefoot for an extra tight fit and minimal foot movement during lifting. Two drawbacks of these shoes are the price, about double the cost of SABOs and the appearance. In my opinion, they look pretty ugly, too. Kind of like little elf boots. Now these shoes are very similar to look at to the Converse shoes. They actually took some inspiration from the Chuck Taylors since so many people were already using them to lift weights in. However, they have some serious design improvements over the converse shoes. Don’t be fooled by the “crossfit” branding on them, these shoes were designed by very high level powerlifters. Where the converse shoes fall short, the Reebok Lite TRs shine. They basically take all of the bad points I made about the Chucks and improve on them one by one. The uppers of the shoes are much more sturdy, especially in the leather versions. They have a reinforced side wall that they call the “stability zone”. You can drive your feet out against the shoe without worrying about it breaking. The grip on the bottom of the shoes is very different to the Chuck Taylors. The Chucks aren’t too bad for grip, but again, the Reebok TRs take it to the next level. With a kind of mini suction cup design, these bad-boys stick to the floor like glue. They feel very solid indeed. The toe box on these is another differentiating feature. It is much wider than on the chucks. I have heard a few different reviews on the toe box, though. I really like the extra space and the extra ground contact you get as a result of it. But, I have heard people complain that there is too much movement within the shoe. I guess if you have narrow feet, this may be a drawback for you. Price-wise, I think these are pretty well priced. Especially when you consider that these can be used for pretty much all of your lifts if you wanted to. At a recent strongman event I attended, there were a whole bunch of competitors wearing the high-top version of the reebok Lite TRs. That shows you how versatile and rugged they can be, Strongmen go through so many different events and their shoes take almost as much of a beating as their bodies do. For an overall lifting shoe, these would be my winner. Of course, this is a deadlift shoe article so the purpose built SABOs have to win. These are your cheap and cheerful option. You can pick these up for around $15, so they could be worth testing out either way. 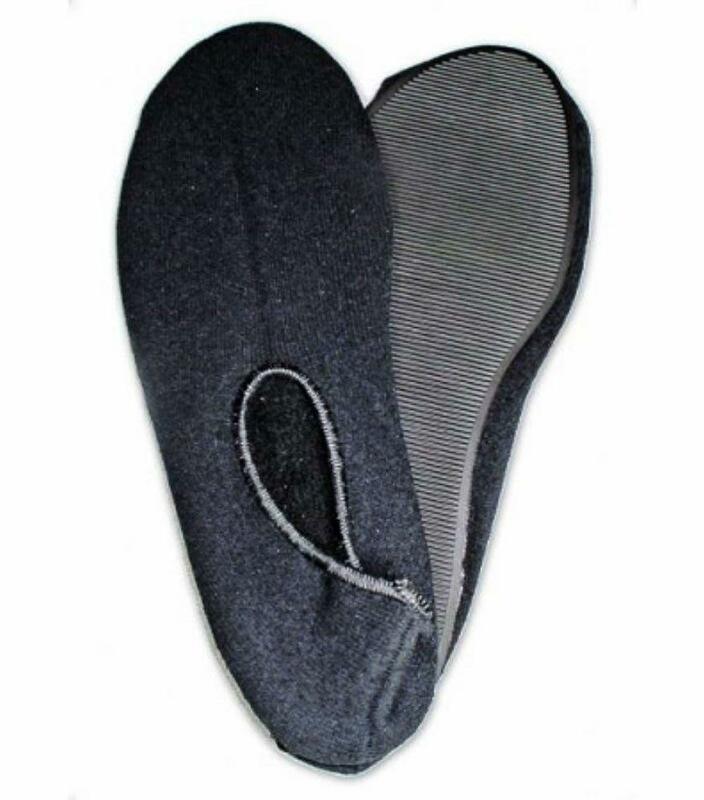 I think the very biggest advantage of the slippers, is that they are extremely thin soled. Around 1.5mm, which feels like you are pretty much barefoot. You will be very close to the ground in these. Obviously, they provide no ankle support and there isn’t anything to push your foot out against on the sides. For sumo deadlifters, I say to forget about these. It just feels to unstable and there isn’t enough grip. If you are a conventional puller and want to be very close to the ground, these could be an option. Keep in mind that you clearly have to change out of them once you are done deadlifting, they aren’t really useful for anything else. They also look a little silly in my personal opinion, not very stylish at all. But again, you don’t get any style points in lifting heavy weights. If you can’t justify spending much money on dedicated deadlift shoes, these could do the job for you. Budget conscious lifter go for the chuck Taylors but be aware performance and longevity will probably not be of the highest standard. Test out some Olympic shoes if you have them. If you haven’t got a pair for squats, then I highly advise getting some anyway. If you have the budget and want to get the most out of your deadlift, then opt for the SABOS. They are purpose-built for deadlifts so it stands to reason they would be the best deadlift shoes. The only drawback is that you can’t use them for too much else and the slight increase in performance may not be worth the higher price to you. That’s something you will have to decide for yourself. Hopefully, you find this guide useful. Here are a couple of other equipment guides that could help with your training: Best lifting belt, lifting straps guide, grip strength equipment. If you did like this article, be sure to share it and let your friends know about it so you can help them with their own deadlifting as well. I really wanted this to be the definitive guide, so if you feel there is anything that should be added, feel free to comment and let me know. Until next time, happy bar-bending.